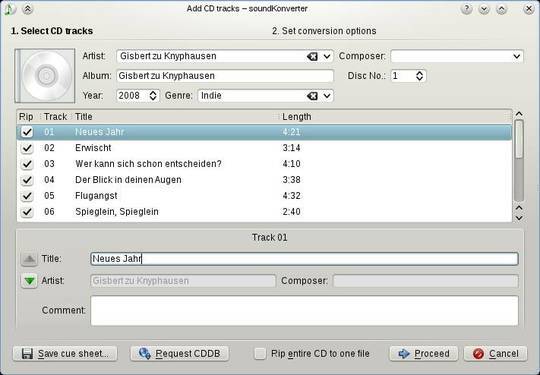 SoundKonverter, the KDE audio converter, Replay Gain tool and CD ripper now is at version 2.0.5 and 2.0.90 (2.1.0 rc1). Contextual help, e.g. if you don’t know what the speex format is, just click on the “info” button next to it. Or if you want to add a file that isn’t supported, soundKonverter will tell you how to enable the format if possible. Possibility to configure which backend shall be used for which codec – or let soundKonverter optimize that for you. Every time you install or remove backends soundKonverter will suggest optimizations if possible. The installers for CentOS, Debian, Fedora, Mandriva, RedHat, OpenSuse, Ubuntu are available in this page. For Ubuntu users, use the Deb package for xUbuntu 12.04 which works good in my Ubuntu 13.10 64 bit machine.